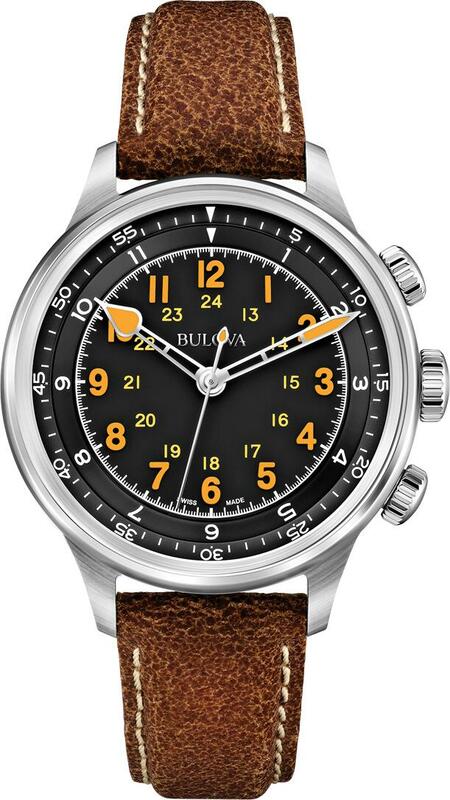 The company has released a new limited edition Bulova watches AccuSwiss Type A-15, the design of which is inspired by the historic model of Type A-15. She produced the brand during the Second World War, by order of the Air Force United States. Novelty has a round case with a diameter of 39.8 mm, a thickness of 14.1 mm in stainless steel. Water Resistant – 30 meters. We label 3 is grooved crown, with tags 2 – head to rotate the inner ring with 12-hour markings and labels from 4 – head to rotate the inner ring with 60-minute markings. Black dial, sapphire crystal with an indoor anti-reflective coating, equipped with Arabic numerals and hands with orange luminescent coating. Equipped clock AccuSwiss Type A-15 Swiss automatic caliber with features indicating the hours, minutes, seconds. 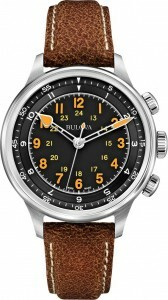 Comes new AccuSwiss Type A-15 on a leather strap brown with stainless steel clasp. Limited production model – 500 copies. Cost – $ 1,495.